DENIA: AT the school of the Most Sacred Heart of Jesus, our Lord. The journey by ferry from Ibisa to Denia took the whole night and morning. The Mother of God in Her Częstochowa Icon was brought to the port at 1.30 PM and the Life Mobile left the ferry and went to the Catholic School of the Most Sacred Heart of Jesus. Although it was January after all, the day was beautiful, sunny and warm – about 20 degrees Celsius. At the school over 300 children with their teachers were waiting for the Mother of God. 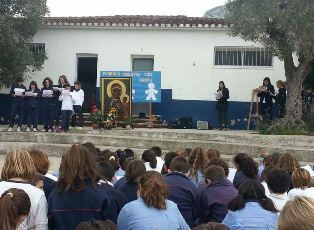 The student delegation carried the Icon to the patio of the school where they had prepared a special podium for Her. Next there were prayers and singing. The children prayed for the protection of human life, for which they had been prepared earlier by the teachers. After the prayers the Black Madonna in Her “Life Mobile” left for Alicante to continue Her pilgriamge.